According to the US Bureau of Labor Statistics, a diverse range of workplace environments is responsible for the development of repetitive motion injuries. For example, not only are warehouse workers susceptible to these injuries, but also office workers. A repetitive motion injury is a musculoskeletal and nervous system injury, consequent to performing the same task, over and over again. Lab workers, according to the Occupational Safety and Health Administration, are also potential victims of repetitive motion injuries. In some fields, one among many tasks performed throughout the workday may be sufficient to bring on this condition. For example, an office worker may be at risk because of the need to occasionally type on a keyboard during the day. However, other tasks, such as reading, attending meetings or speaking on the phone may be reprieves from musculoskeletal strain. Lab worker environments are unique because of the variety of tasks applying strain that could yield repetitive motion injuries. As any workers’ comp lawyer in Chicago is aware, the common theme is an activity that stresses joints, inflames tendons, pinches nerves or restricts blood flow. 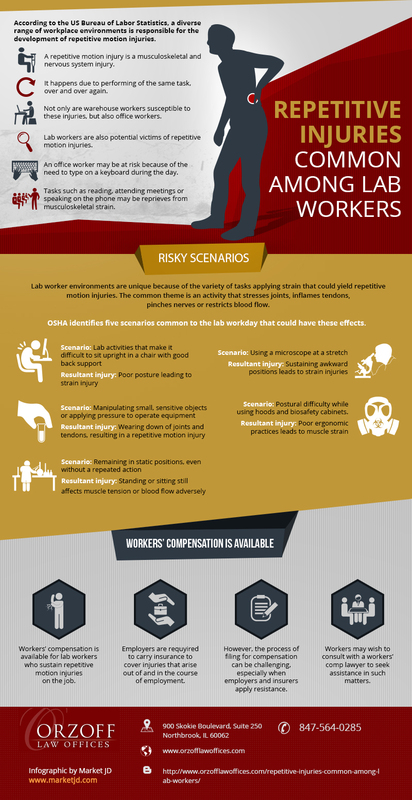 OSHA identifies five scenarios common to the lab workday that could have these effects. One of the most prominent culprits of repetitive motion injuries is poor posture, which may be hard to avoid in the lab workplace. Specifically, if lab activities make it difficult to sit upright in a chair with good back support, a strain injury could follow. Some lab tasks may require sustained muscle tension, such as manipulating small, sensitive objects or applying pressure to operate equipment. This effort can wear down joints and tendons involved, possibly resulting in a repetitive motion injury. Remaining in static positions can also be problematic in the context of repetitive motion injuries. Even without a repeated action, which is typically the problem, standing or sitting still can have adverse effects on muscle tension or blood flow. Using a microscope, another common practice in lab workplaces, oftentimes requires sustaining awkward positions. A workers’ comp lawyer in Chicago would know that these awkward positions are common antecedents of strain injuries. Other potentially risky scenarios for lab workers include poor ergonomic practices when using hoods and biosafety cabinets. Fortunately, in Illinois, workers’ compensation is available for lab workers who sustain repetitive motion injuries on the job. Specifically, Illinois law requires employers to carry insurance to cover injuries that arise out of and in the course of employment. However, the process of filing for compensation can be challenging, especially when employers and insurers apply resistance. For this reason, Illinois workers may wish to consult with a workers’ comp lawyer in Chicago.